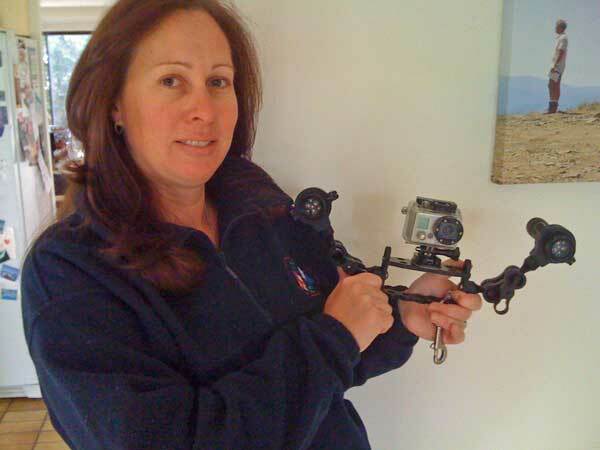 Michael McFadyen's Scuba Diving - GoPro HD Hero Video My nephew Scott Barry purchased a small camera in the late 2000s that he used to record still photographs as well as video when he was boogie boarding. This tiny camera was brilliant, as small as a cigarette pack, but able to record at high quality. In addition, it came with a waterproof housing. In 2010 GoPro released a new version, the GoPro HD Hero. This is a high definition (HD) video camera which can also take standard definition (SD) and still photographs. It also comes with a 60 metre waterproof housing. It has now been superseded by the GoPro HD Hero 2. After seeing a few people using these, Kelly decided to get one. Her idea was to use it for scuba diving as well as when we do our four wheel drive trips. She especially wanted to use it for our trip to Chuuk Lagoon in October 2011, so in May 2011 I placed an order for one I found on Ebay from an Australian supplier (so I thought). The cost of the camera was $399 including a 16 Gb Service Desk card. In fact, the camera came from the USA, it appears the Australian supplier sourced the camera from there. The SD came from Australia. Later in the month I purchased another one, this time as an 18th birthday present for Scott from myself and my brother and sister. This one was purchased from a web site in the USA and total cost was $345 delivered. We purchased the helmet version, which comes with a head strap (like used for head lamps - do not use underwater as it will come off) as well as a number of mounts you can stick to surfaces. It also has a mount that comes as part of the packaging which you can use as well. As well as the waterproof housing, there is another back that is not waterproof and which lets sound in to be recorded. It also has a couple of attachments that let you change the angle of the camera when connected to the mounts. The camera records onto SD cards and can take a 32 Gb maximum. The battery is charged via a USB cable. There is no screen on the camera, but with the wide angle for most things you do not need. However, after Kelly's first use underwater she decided she wanted one so we purchased the screen. This comes with a series of four new back doors for the housing and attaches easily. I had to upgrade the firmware for it to work but this was easy. The other thing you need to know if you are using the GoPro underwater is that with the standard setup, the results will be a bit blurry. This is because the standard lens port on the housing is domed. You need to have a flat port to get sharp vision. There was no GoPro port (as of May 2012) but there are a number of other solutions available on the internet. In May 2012 they did release a very well priced housing that has a flat port. It is probably better now to purchase this and reain the normal one for land use. We purchased an Oculus flat port via Ebay for about $32 delivered to Sydney from Thailand. There are actually two ports provided for this price. The new port is attached by removing the six screws on the retaining ring and then pulling the existing clear port. The large o-ring (not really an o-ring, but performs that role) is put back, the new port placed over with the holes lined up and six new, longer screws installed. I have checked the waterproofing of the housing each time I have changed from the standard to flat port (I will explain why I have changed many times below) before using the camera in it. When the new flat port is in place, there is quite a bit of vignetting on most of the video modes (as well as the photos). There is no vignetting using the standard port. This is why I need to change the ports, because when we use for above water, we do not want any vignetting at all. Mode 4 has a lot of corner vignetting. Mode 5 appears to have no vignetting but it seems to be not as sharp on the screen as Mode 4. After a lot of testing, we decided to use Mode 5. While the GoPro comes with a lot of mounts, we decided to just use it with a stainless steel clip (to connect to a BCD ring when not in use) connected by a small D shackle and a wrist strap for when it is actually being used. I have placed one mount on one of our Apollo underwater scooters to see what vision looks like that it shoots. This came out great. The camera is very basic, no focus, no exposure control but very easy to use. To use the camera is easy. It is a simple matter of turning on the camera with the front button, then pushing the shutter button for start and stop. When recording, a red LED on the front flashes. Once you have stopped recording, the small LCD screen on the front shows how many videos have been taken. It is reasonably easy to change from video to stills to time lapse, but it is harder to change from one video mode to another. These changes are made using the On/Off button at the front. Really, once you have picked a video mode for underwater, you really do not need to change. With the new LED screen attached to the back, it is even easier as you can see what you are videoing and also see that the video is recording. You can even play back the last video you shot to check that it worked. Once back on land, you can view the videos on a TV by plugging in a cable and connecting to the component input on the TV. To download the videos to a computer, you can connect via a USB cable or take the SD card out and putting in a card reader (most laptops now seem to have an SD card slot). You then copy the files across to your computer. As indicated above, to recharge you just leave plugged into the USB port with the camera turned off. You can also purchase cheaply on Ebay extra batteries and a charger. In April 2012 I purchased for Kelly°s upcoming birthday some lights. The real failing of the camera underwater is its lack of ability to handle low light levels. After a lot of research I purchased a setup made by Light-for-me. This consists of a base (actually a goodman handle), two small arms and two lights. The base does not have a mount, so you need to either purchase another mount or do what I did, glue one of the mounts provided with the camera to the base and then put four stainless steel screws in through the predrilled holes into the mount. These needed to be shortened to enable it to work. The lights are Light-for-me 3XPG MINI video torches. They have 900 lumens and 120° coverage. Together, this is more than enough light and angle for the camera. The torches are powered by 18650 Lithium ion rechargeable batteries. These were not included but I already had some from a failed Chinese torch. I ended up purchasing from the UK from www.dirdirect.com. The cost was £296 delivered to Sydney (you do not pay VAT then about AUS$460). You can get batteries and charger from Ebay for about $20. The lights have transformed the underwater ability of the camera dramatically. The videos Kelly and I have got since then are much better than what we were previously getting. It is especially noticeable on deeper divers and in overcast conditions. The one drawback with the GoPro is that the files are very large. For example, a 25 second video shot on mode 5 is about 48 Mb. This means that you can shoot about 135 minutes of video on a 16 Gb card. More than enough. Because of the big file size, you will need a grunty computer to process the files. My four year old Windows XP will not play the files, all you see is a very very jumpy series of stills. While I can process the files using Adobe Premiere Elements 2.0, I cannot preview the clips or the finished product. Luckily Kelly had decided already to purchase a new laptop. She got a new Dell Core i7 2620M 2.70GHz with 6 Gb RAM running Windows 7. This runs the clips perfectly as well as processes them in Premiere Elements 10 without problems. Therefore, you will need a decent computer to utilise the video that you shoot. Another thing I have been playing around with is using the time lapse. I used the mounts and attached the one that came with two straps to a 3lb weight. With these I can make sure that the camera is parallel to surface and angle it up or down. I have used so far to record moray eels, octopus, starfish as well as general scenes where there are lots of sharks and fish. I have found that one shot per second is best. This means that you need to shoot one minute to get just over two seconds of finished video. To make the video, you need to (in Premiere Elements 10) select all the photos, right click, select Make Slideshow and then set each photo to last for one frame. As there are 25 frames per second (for PAL - 30 for NTSC), this means one second is condensed to 1/25 of a second. You need to shoot at least two minutes to make it useable, more like three or four at a minimum. The results are quite amazing. This is a brilliant small camera for someone who does not want to carry around a large housing and who wants a cheap solution. Highly recommended.